Back in my college days of the early 1990’s, Crunchy Granola was the phrase we used to describe someone who was a little, shall we say, outside the mainstream. Of course, this was before the mainstream engulfed the ideas of conservation, ecological stewardship, grunge, or angst…often as a means of convincing consumers to part with their disposable income. Wow, how jaded did that sound? Or maybe I’ve just watched too much Mad Men for my own good. Regardless, Crunchy Granola was not used in a complimentary manner at that point in my life. Thankfully, through the kind intervention of Pork Cracklins, that has changed. I came home one day to find a #lovebomb on my front porch. Inside was a card that brightened my spirits, some lovely artisanal chocolate, and a batch of her homemade crunchy granola. And right then and there, I changed my tune. Crunchy Granola is not all sticks, hemp, and patchouli as life on the campus of UMBC from 1990 to 1994 indicated. Crunchy Granola is perfectly baked oats and coconut that has been lightly sweetened, salted, and spiced before being married with dried fruits. Actually, that is my idea of Crunchy Granola. The beauty is that it can be anything you want it to be. Nuts, other fruits, or even little bran like sticks if that’s your thing….they’re all good. I’ve made this a number of times since that first #lovebomb encounter. I make it by the gallon, or so it seems, and it’s never enough. BAH Note: Don’t make my mistake and add the dried fruit to the oats before the granola is cooked. The fruit will end up rock hard and capable of doing some serious dental damage. Heat your oven to 300 degrees and line a half sheet pan with parchment. In a large bowl, stir together the oats and coconut and set aside. In a medium saucepan, cook the brown sugar, canola oil, maple syrup, spice, and salt over medium-low heat just until the sugar dissolves. Use a spoon and carefully taste the sugar mixture. If you want a saltier granola, add salt 1/4 teaspoon at a time until it is to your taste. Pour the heated sugar mixture over the oats and coconut and stir with a silicone spatula or wooden spoon until the oats and coconut are thoroughly coated in the sugar mixture. Or, if you prefer, skip this step entirely and just add the canola oil, brown sugar, maple syrup, salt, and spice to the bowl of oats and coconut. Use a spoon, or your hands, to make sure everything is evenly combined. Taste and adjust the salt and spice to your liking. Spread the oat mixture onto the sheet pan and bake until the granola is golden and crunchy, anywhere from 60 to 90 minutes, stirring every 20 to 30 minutes. 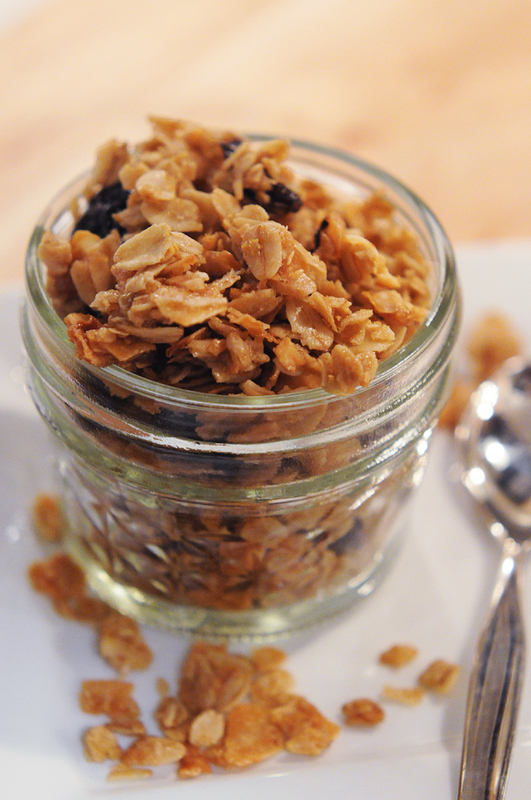 Remove the pan from the oven, transfer the granola to a large bowl, and add in the dried fruit and ginger (if using). Store in an airtight container. Flashback Friday – Bon Appetit Hon! I love a good crunchy granola. As for the people, we called them “earthy-crunchy”. Now I mostly call them NR9Rs, which stands for north of route 9, which encompasses the whole Smith College to UMass to Amherst College area. It is soooo crunchy there. How funny is it that we had similar “crunchy” expressions?� At UMBC we also talked about Lab Coat Guy…but that was strictly a local campus phenomenon, and not in the good sense. Looks good, Wendi! And this reminds me of the lovebomb you sent me–those coconut macarons. YUM! What a delightful surprise they were.